I love the plain because they just melt in my mouth and taste like a potato chip! Salt & Vinegar is my second and I can’t wait to try Sweet Potato. Love the salt and vinegar with my turkey chilli! I was addicted to the original blue bag ones but on Saturday I came across the sweet potato ones. Holy cow, they’re phenomenal! i love the salt and vinegar! I love the plain ones! They are so tasty. I’ve only had the plain ones, but I’d probably say salt and vinegar would be my favorite because I just love salt and vinegar! Has no one else tried the sweet potato ones yet? I have never tried or heard of these but you made them sound delicious! @Elana – I’ve never seen them! I wonder if they’re only in NYC? I have only tried one flavor of PopChips (salt and vinegar, because I really like vinegar) and they were really good. I usually dislike potato chips, so I was shocked to like these so much! I am always a fan of BBQ! I’ve always been a HUGE fan of potato chips, which of course are not the healthiest thing out there for a person to snack on. 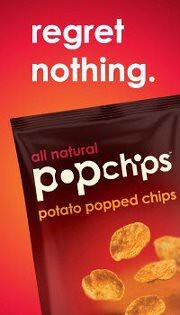 I was so happy to find PopChips, I love the regular flavor (plain) and it’s a nice bonus that they are low fat! I’m a fan of the BBQ flavor, I actually prefer corn chips and these are probably the first potato chip I’ve liked/bought. 2 months ago i rejoined WW for like the 8th time. I am really loving the new pointsplus program. I am down 10 lbs.—- only 15 lbs to go to my pre baby weight. The babies are now 3! I like the ones in the black bag; I only ever tried them once at a walk out here in Portland! I love the BBQ because it’s not an overly sweet BBQ, like the rice cakes are.